The Case Type Definitions gadget (under the > Process & Rules > Case Management landing page) is used to configure and manage the structure of the case management application. This article describes the information the gadget provides and some of the functions you can use. Note: This article describes PRPC 6.1 SP2 features. For similar features in PRPC 6.2, see Introduction to the Case Designer. The tree comprises a group of case types, each of which inherits from Work-Cover- and has a Case Type rule. A case type can cover or be covered by another case type. The tree displays covered case types as indented nodes beneath the covering nodes. Note: You can create work types that inherit from Work- . They can be covered but cannot cover other case or work types. Top-level case — Serves as a top-level parent case type within a work pool and is not covered by another case. A work pool can contain more than one top-level case. In the Employee OnBoarding Application shown above, New Hire Case is the top-level case. Subcase — Nested beneath (covered by) a case at any level, a subcase typically must be created and resolved before the parent case can be resolved. A subcase can also parent other subcases. Unless referred to in the context of its parent/child relationships, a subcase is usually called a case. In the example, Orientation Meetings and Equipment Setup are subcases of New Hire Case. Add new case types in the application. When you create a case type, you can designate it to display in the gadget as a case or as a task (each has its own icon). The gadget helps you simplify the process of creating the Class , Case Type , and other standard rules used by a case type. Define service level goals and deadlines. Determine whether to automatically create subcase work items when a parent case is started or enable the user to manually create the work. Map user roles to work item access. Indicate whether a subcase or task must be created and resolved in order to resolve its parent case. Limit the number of subcases that can be created manually or automatically. Name — The name of the case type. An icon appears in front of the name to indicate whether it has been defined as case or as a task. Instantiation — States whether a work item for this case type is automatically started when the parent case starts, or when the user manually starts it while working on the parent case. Required — A checkmark indicates that the case or task work must be created and resolved in order to resolve its parent. Max Allowed— For this case type, the maximum number of case items that can be added to the parent. Owner— Displays the access role associated with this case type. Attachments — The number of attachment categories defined for each case type. Legacy — Indicates that this work type extends from Work–, not Work–Cover– ; it can be covered by case types but cannot cover other work or case types. 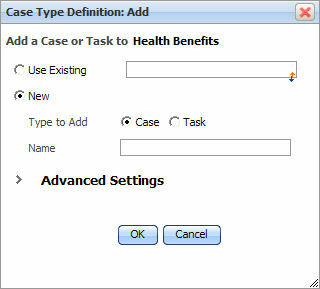 Add the case or subcase that is the top-level case directly to the work pool by right-clicking and choosing Add. In the Add dialog, enter a new case name and click OK.
To modify the processing behavior of the new case or task, select the item and right click to open the Properties menu. The options enable you to define attachment categories, service level goals and deadlines, access roles, and instantiation preferences. Derives From. Choose the work type this new type derives from. RuleSet. Choose the RuleSet of the new type. Version. Choose the RuleSet version. Create start flow. Click to create a standard start flow rule for this type. 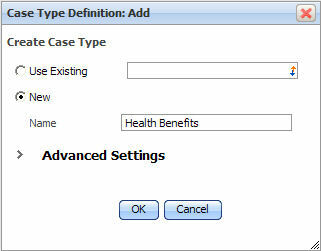 As you build out a case hierarchy, check your case definition tree structure using the Case Manager portal. Revise the top-level case type tree structure to define case types that require, or may evolve, unique processes. Afterwards, you may further define the appropriate subcases, and add associated tasks. Note: If the case or task is not a case type (not in Work-Cover- class) you can only Rename and Remove the node using the right-click menu. Right-click a case or subcase and choose Properties > Attachments . Enter the attachment description, select its type ( file or URL), and choose the attachment category. Indicate whether the attachment is required. If the attachment type is a file, click the Browse button to locate it. Its name appears in the File Name field. If the attachment is a URL, enter the address in the Reference field. Indicate whether the system will create the attachment automatically. 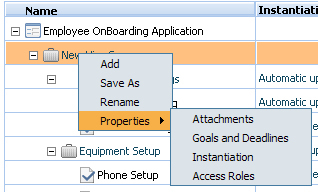 See How to enable attachment security using attachment categories and How to control access to categorized attachments. Click OK to save your edits and close the dialog. 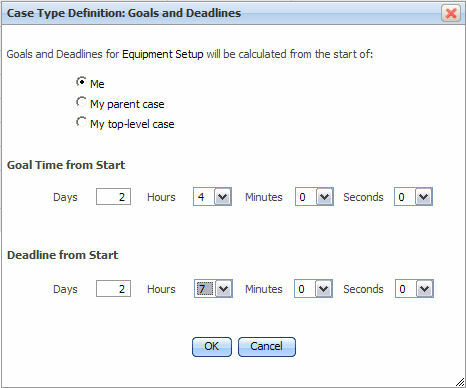 The Goals And Deadlines configuration screen allows you to easily view and change the Overall Service Level settings for the selected case type. Right-click a case or subcase and choose Properties > Goals & Deadlines . Select Goal time from Start and Deadline from Start, in days, hours, minutes, and seconds. When the user selects the item from the Add Work... action drop-down list in the parent case's work form. Note: Users can also manually add subcase and task items (called ad-hoc work) to existing cases within the Case Management portal. Ad hoc work items are not case types and are not formally included in the case management application structure. These items appear only in the portal and not in the gadget.